Chronic conditions are generally defined as medical conditions that cause reoccurring health problems and last for either months or years. 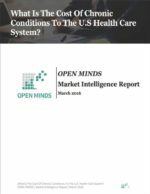 The high costs associated with chronic conditions and the prevalence of chronic conditions among America’s growing elderly population has lead the United States Department of Health and Human Services (HHS) to work on developing a methodology to define and identify chronic conditions uniformly. These conditions were chosen not only because they represent conditions that span different populations and settings, but also because they can be determined using ICD codes, which makes classification much easier. In 2013, the cost of chronic conditions was approximately $623.8 billion – this is an 88% increase since 2002, when spending on chronic conditions was approximately $331.9 billion. However, the relative cost of chronic conditions has not changed significantly. In 2013, chronic conditions accounted for 45% of the $1.4 trillion in total health care expenditures in the U.S. In 2002, chronic conditions accounted for 41% of the total $810.7 billion in health care expenditures in the U.S. Spending on chronic conditions have risen almost every year between 2002 and 2011, when spending peaked at $643.37 billion. This slight decline in spending for chronic conditions is in line with an overall decline in health care spending during the same period. More than half of adults in the age groups of 18-44 and 45-64 had one or no chronic condition. For adults over the age of 65, the majority (42.3%) had two to three chronic conditions. However, although, adults over the age of 65 were more likely to have chronic conditions, per person expenditures for chronic conditions was highest among adults ages 45-64 with four or more chronic conditions. What Chronic Conditions Result In The Highest Overall Spending? What Chronic Conditions Result In The Most Spending Per Person? What Is The Cost Of Multiple Chronic Conditions?